The British Schindler: Sir Nicholas Winton, commemorated with his own memorial gardens in Oaken Grove Park, Furze Platt, Maidenhead. Image by Michal Kalasek, 2011 (via Shutterstock). 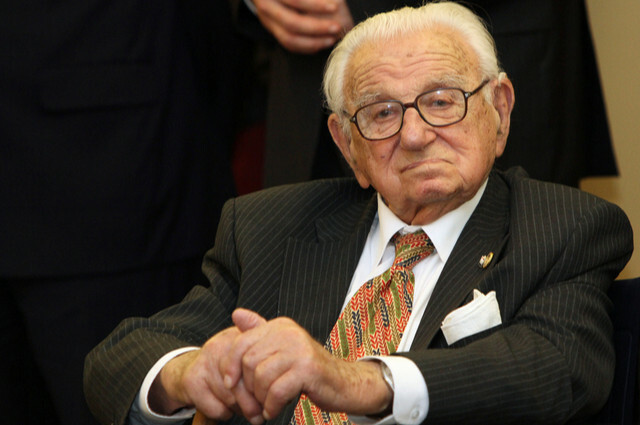 Before his death at the ripe old age of 106 in 2015, Sir Nicholas Winton was known as The British Schindler. Before the Second World War, he orchestrated the evacuation of 669 Jewish children from Czechoslovakia to London. Shortly after his death, his memory will be commemorated by a memorial gardens in Oaken Grove Park, Maidenhead. On the engraved plaque, there was a spelling error. On the engraved plaque, ‘ethics’ is misspelt as ‘ethnics’. Though the gardens are set to open this summer, some eagle eyed readers in the Maidenhead Advertiser have noticed the spelling error. Sir Nicholas Winton called Maidenhead his home. A humanitarian to the very end, his other achievements included the formation of what became Maidenhead’s branch of the Mencap charity. He was also a fencer, a flight lieutenant, and a stockbroker. Each quote, including the one with the spelling error, were chosen in cooperation with Sir Nicholas Winton’s family. Thankfully, the error has been rectified, in time for the gardens’ official opening date. Able Engraving and Design, 01 June 2017. This entry was posted in Able News and tagged gardens, memorial, Oaken Grove Park, Royal Borough of Windsor and Maidenhead, Sir Nicholas Winton, spelling error on 1st June 2017 by admin.